Here's another card made using MY clip art available at my cathiesparties shop on Etsy. 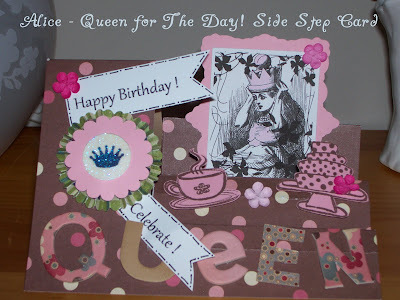 The clip art Sentiments, Alice image and Rosette are from my kit available @ cathiesparties @ ETSY. For a quick link just click on the link on my sidebar showing scrolling pics of items in my shop. Hope this card inspires you! Let me know what you think. Awesome card Cathie! Beautiful design and I love the products from your kit!